Somali pirates say they have thwarted an apparent revolt by the crew of a hijacked Ukrainian cargo ship, according to reports. An unnamed pirate told the AFP news agency that sailors of the MV Faina tried to "harm" two of their captors. The ship is carrying 33 tanks and other weaponry and was seized by pirates two and half months ago. A Ukrainian foreign ministry spokesman said they had not received any information of the incident. "Some crew members on the Ukrainian ship are misbehaving," the pirate said. "They tried to harm two of our gunmen late Monday. This is unacceptable, they risk serious punitive measures. "Somalis know how to live and how to die at the same time, but the Ukrainians' attempt to take violent action is misguided." He claimed that two of the pirates were taken by surprise when a group of crew members attacked them. "Maybe some of the crew are frustrated and we are feeling the same but our boys never opted for violence, this was a provocation," he told AFP by telephone. Another report of the incident, by Russian Ren TV, quoted one of the pirates as saying that the crew responsible would be "seriously punished". 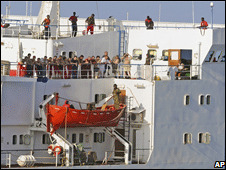 Gunmen seized the Kenya-bound MV Faina, carrying 33 tanks, grenade launchers and ammunition, on 24 September. The ship, which is currently anchored off the pirate stronghold of Harardhere, has a mostly Ukrainian crew of 21. Pirates had initially demanded a ransom of $20m (£13.5m). In November, a Kenyan maritime official confirmed that a deal had been struck between the ship's owner and the pirates, and that the two sides were discussing the ship's release. Details of the agreement have not been revealed. Meanwhile, the British commander in charge of the EU's anti-piracy mission says the force will station armed guards on vulnerable cargo ships in the Gulf of Aden. Rear Admiral Phillip Jones says his priority is to ensure safe passage for ships transporting food aid to Somalia. The EU force - which includes four ships and two maritime reconnaissance aircraft - will take over from Nato ships on Monday. Rear Adm Jones said the task facing the mission was enormous. "I'd be the first to admit that a naval force itself cannot eradicate piracy... but we can still make a significant contribution to combating piracy," he said. 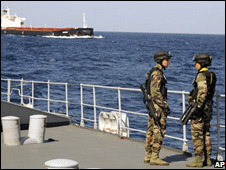 The task force - codenamed operation Atalanta and working under a UN mandate - is not allowed to board seized ships or to free crews held hostage. Somali navy chief: World's worst job?